I've spent the past 3ish years telling Aaron that all I really want out of life is for the grocery store to pull together and bag my groceries so all I have to do is swing by, open the back hatch, load up and go home. No getting kids out of the car, no wiping down grocery carts, no scouring aisles. Just pick up and go! WAL MART DOES THAT NOW. This is totally non-sponsored (although, I'm open! Call me, Wal Mart!) but my friend posted about this newish service on Facebook a few weeks ago and it's been a total life changer. They don't have it at all locations (although I've heard they're slowly expanding) but my closest option is literally one mile from where my kids have swimming lessons so my life is basically amazing right now. You hop on the website, pick out your groceries and tell them what day and time you'll be there. 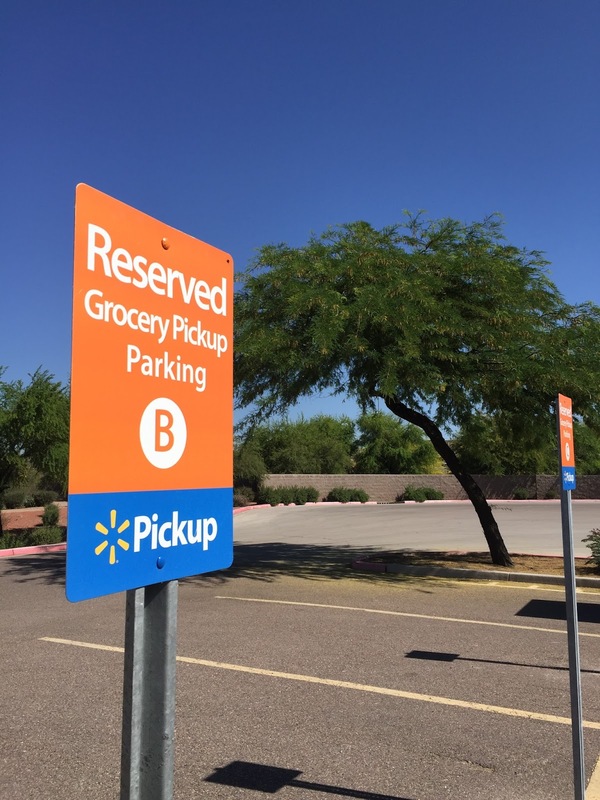 Then you go to the Wal Mart location, follow the signs to grocery pickup and call the number on the sign. They bring your groceries out and load them in your car for you. AND THAT'S IT. IT IS THE BEST THING EVER. Back in December I attended a favorite things party with 5 of my closest friends from my old neighborhood and one of the girls started telling us about Aussie Kayla Itsines' Bikini Body Guides. I was just getting to the point where I was ready to start working out again and my ears perked up big time. I've got Bikini Body Guide 1.0 and I'm on my second attempt (I made it up through week 3 during a brief period of The Caboose sleeping slightly better. Then her sleep went to pot and I gave up). I'm in the midst of week 4 right now and I was (am?) planning on writing a dedicated post about this in a few months BUT swimsuit season is coming so I wanted to talk about it now in a semi-brief manner. I FEEL SO GOOD. Like, I'm becoming one of those people who LOOKS FORWARD TO EXERCISING. WHO AM I. WHAT IS LIFE. I'm baaaarely starting to see results (they'd probably be a lot quicker in coming if I cleaned up my eating a bit more) but I feel amazing and I can tell I'm getting a lot stronger. When I started the guides I couldn't do a straight leg sit-up to save my life (see: recent pregnancy and c-section). Last night I was laying on the floor with The Caboose and I did one. Like it was nothing. I hadn't even realized I'd progressed that far. It's a beast at first but it gets better! Given my newfound love obsession interest in podcasts, this elevated Grace even MORE in my eyes. I mean, she was famous before but now she's PODCAST FAMOUS. And also she's super relateable so you should go listen. Because I texted her halfway through and was like, "Yeah, Aaron and I patted ourselves on the back for years about not having cable and then Netflix happened..." and she gets it. What are your Caps Lock Loves lately? Hmmmm, Caps Lock Loves...that's serious love right there. Sally Hansen 2-step gel nail polish has got to be right up there, for the last few weeks I've been able to grow my nails out to unprecedented lengths. I mean, they still don't go beyond the end of my finger, but they are still longer than they've ever been. ALL OF MY NAILS, not just the ones I don't manage to chew on. I consider this a huge win. And, to go with my new, lovely nails, I've started putting cuticle cream on them every night...so now my cuticles don't look mangy and my hands, for once, don't resemble those of a 19th century washer woman. It's like, I don't know, I'm kind of turning into an adult....or something. WHERE DO I START COMMENTING. I hate grocery stores more than anything. Hallelujah to your new find!! I have some local startups that deliver groceries for good prices (bless you, silicon valley) so i use that when needed. GAME CHANGER. Hours of my life and sanity returned to me. Second, KAYLA ITSINES!!! I am part of this movement too and I am obsessed! I did the 4 pre-weeks and 4 regular weeks (let's pretend i was 8 wks in then, ok?) before, ahem, medical things sidelined me for a bit. But I'm absolutely jumping back in as soon as I can! Which, is hopefully in 2-3 weeks. I have never liked working out more! I actually feel all stressed now without it. It's like the perfectly achievable yet challenigng workout. Anyway. End fangirling. But now we have something else to gChat about. I'm glad you found walmarts delivery service in your area!! I remember commenting about it awhile back. Lots of our regular grocery stores do it here too and it's amazing!! !